Your house isn’t the only thing that needs spring cleaning! When the weather changes, so should your beauty routine. I’m going to give you a few easy tips on how to spring clean that beauty routine and transition your skin care regimen from winter to something better fit for warmer days. Emphasis on easy,” you know I’m not going to send you on a mission to buy $200 face cream or insist you change all your favorite products out for new ones. Spring Cleaning Your Collection Let’s start with the basics, shall we? The first thing you need to do to spring clean your beauty routine is actually throw stuff out! This is also the hardest part for me. I’m not a hoarder but I do have a difficult time letting things go. Even if it’s a $2 lipstick. Follow these steps to spring clean your beauty supplies. Start by gathering everything from the drawers, under the sink, the counter, your shower and any other place that you stash your beauty supplies. Put them all in one spot. Sort by type. Shampoos over there, lotions over here, face products in the corner, etc. This makes it a lot easier to see what you have and what you can get rid of. Look for obvious expiration dates first. Some beauty products have them. Most, alas, do not. If it’s obviously expired, toss it. Next, figure out what has been lingering around too long. For example, how long have you had that tube of mascara? If it’s more than three months, you should toss it. I’ve kept it longer without an issue, but you’re basically playing eye plague roulette. I really like this post by Good Housekeeping, because it gives you pretty much all the different types of skincare products and their shelf-life. Toss anything with less than 1/4 a jar (bottle, container, whatever) that you aren’t currently using. Here’s what happens to me: it gets to the bottom and I get really excited to try something else. I figure I’ll save that last itty bitty bit for an emergency. That emergency never comes. So the giant bottle sits there with nothing in it for an eternity, until it ends up in the “purge because its expired” section. Play kitchen chemist. If you have tiny bits left of three different similar scents of lotion, try mixing them together! You could either create a totally new scent or end up with the most disgusting aroma on the planet. If it’s a winner, finish it up. If it’s a loser, you were just going to toss it anyway! I wouldn’t do this with anti-aging face products, only because I’m not sure if any of the ingredients can interact with the others. It’s safe to mix like products of different scents, but once you get into proprietary formulas, it’s best to just toss it unless you really know what you’re doing. Donate: You have 20 full bottles of shampoo and one head. You know you’re going to buy MORE shampoo before you even come close to putting a dent in that collection. Donate a few of those bottles to friends, family or, even better, women’s shelters. 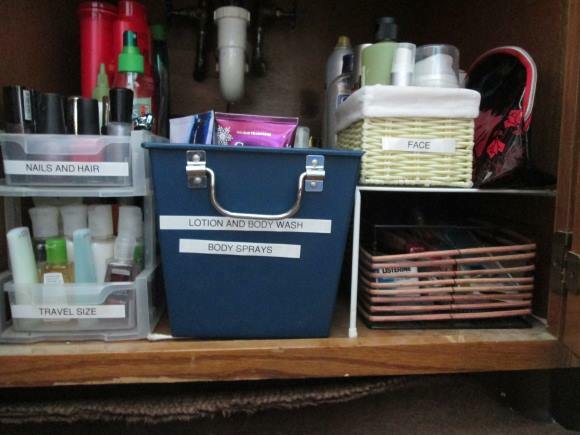 Once you’ve finished spring cleaning your beauty supplies, put back what’s left in some sort of organized manner. Visit that post I mentioned above. It actually works, I just have to go in every few months and cull the sections. Gentle exfoliation: Get rid of all those dry, dead skin cells with a light, gentle exfoliating cleanser. You can go out and buy one, or you can make your own at home. A simple sugar/water mixture is really all it takes to gently remove dead skin cells. If you’d prefer to buy something, I’ve always loved St. Ives. Their Even and Bright Citrus Scrub is fantastic. Plus it’s less than $5. Moisturizer with sunscreen: While this is important year-round, if you were pretty much a hermit during the cold months you may have skipped sunscreen more often throughout the winter. Now that you’re spending time outdoors again, it’s a MUST. I love the Body Shop’s Vitamin C Daily Moisturizer SPF 30. At $20, it’s a bit pricey for single moms on a budget, but a little goes a long way. Redness control: If you have allergies and end up looking a bit like Rudolph, redness control is a must for your spring beauty routine. You can go a few routes here: either use a skin care product that corrects redness, cover it up with makeup or a combination of both. I love Yes to Grapefruit’s Correct & Repair because it corrects many issues at once. The problem? It’s $15 for 1.4 oz. Eeek! So if your budget is tight, a decent liquid foundation will help you cover up that redness until your allergy medicine kicks in. Also, important tip: splurge on the GOOD soft tissues for blowing your nose! That extra few cents will go a lot further to keeping your face pretty than an expensive product. Hair Care: During the winter, I can get away with washing my hair maybe twice a week. It’s not gross, trust me. I’ve been using my stash from my Perfect Hair Day review all winter long because their stuff is just so awesome. Between them and the dry air, my hair doesn’t get oily. In the spring, I have to wash my hair more often to get rid of pollen particles and ease my allergies. 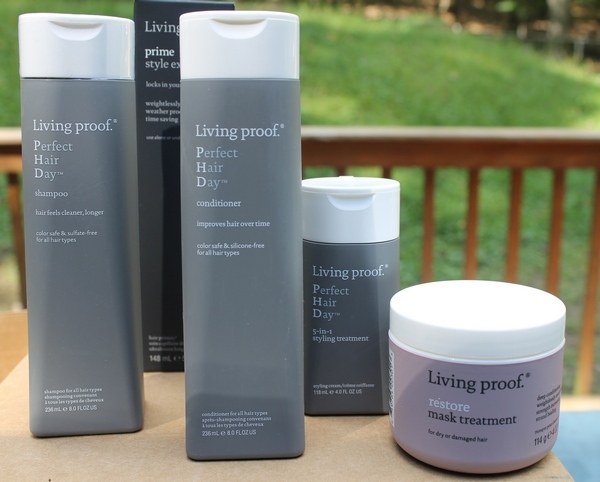 The Living Proof Perfect Hair Day line isn’t exactly budget-friendly. It’s a splurge, and worth it, but not everyone has the money for a splurge. I’m a big fan of the Aussie line because they have something for every hair type, work really well and cost under $5 each usually. That was a whole lot more information than I originally thought it would be! 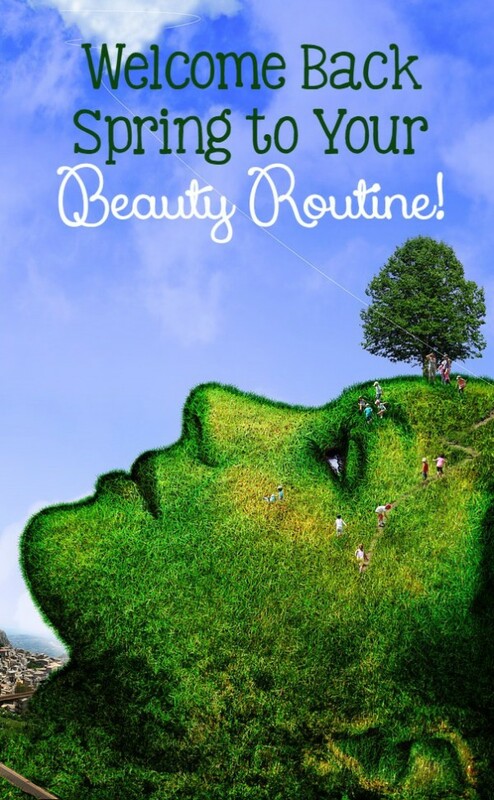 Let me try to sum it up for you in one sentence: spring cleaning your beauty routine means getting rid of all the old crap, lightening up your load and switching out heavy winter products for easy, breezy spring products How do you spring clean your beauty routine? Tell me your tips in the comments! Deer Chic by How Was Your Day? I just did this last month. It was so hard to throw things out but I am so much more organized now!